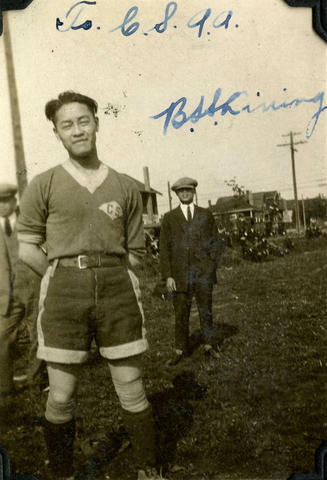 Photograph shows a Chinese Students' Athletic Association soccer team member standing outside with a young man dressed in a suit standing behind him. Photograph is inscribed "To C.S.A.A., B.S. Shining." Mirroring in dark areas. Photograph is mounted to an album page using photo corners.